Synopsis: A teenager teams up with the daughter of young adult horror author R.L. Stine after the writer’s imaginary demons are set free on the town of Greendale, Maryland. Review: Before YA fiction was solely developed as a target market for the next big cinematic franchise there were actual stories to be read. I was a voracious reader when I was younger (who has the time now?) and I loved latching on to a series of books that I could develop a rapport with. There was a certain safety in finding multiple volumes of a continuing story or interconnected adventures that made reading exciting. I read a lot of R.L. Stine’s more teen centered fare when I was at the target age and his Goosebumps series was developed for a slightly younger crowd. Short, sweet, and filled with any number of nightmarish happenings that didn’t feel all that scary, these were thin page-turners that helped prep youngsters to sleep without a nightlight and explore loftier fare as they grew older. I went back and read a few of the early works in advance of the big screen adaptation of Goosebumps and found them to be energetic, creative, and breezy reads. No wonder they’ve spawned several spin off novels, a T.V. series, and a handful of T.V. movies. 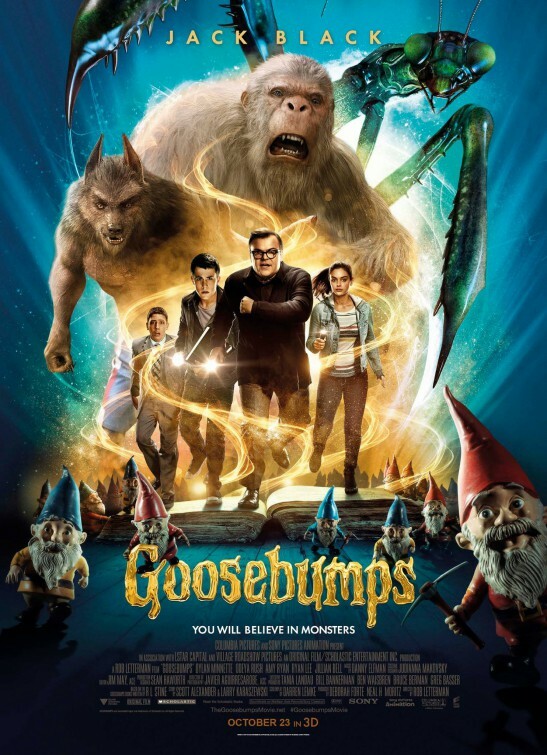 So the time had finally come to make a Goosebumps movie and the question was, which of the hundreds of stories to tell? In a smart move, screenwriters Mike White and Darren Lemke (Jack the Giant Slayer) mashed many of the memorable monsters together in one film, front-loading their movie with fan favorites and several of the lesser known creepies that Stine thought up over the years. In a further meta-twist, R.L. Stine would actually be a central character in the film, with the plot involving the secretive author helping teens in a small town after they accidentally release a bevy of ghoulish delights that escaped from Stine’s library. Director Rob Letterman has cast the film with a strong roster of young and old talent and the movie has a Jumanji-like feel to it that made it a perfect choice for an early fall evening. I was surprised at how much I was enjoying the film for the first hour or so until some budget conscious special effects took center stage and the movie became less interesting with each passing oogy-boogy moment. What starts as a pleasantly genuine mystery/adventure turns into another run-of-the-mill everything-but-the-kitchen sink kinda experience. As R.L. Stine, Jack Black (The D Train) is mostly amusing until you realize that he’s on auto-pilot, recycling the same manic seriousness that is his fallback whenever he’s feeling less than challenged. Employing his strange British accent (the real Stine hails from Ohio) and wide-eyed double takes, Black at least believes every line he says and commits fully. Still, I find myself longing for the actor to continue to take steps outside of his usual shtick…like his stellar work in Bernie shows he is more than capable of. Dylan Minnette (Prisoners) is a nice all-American teenager next door, a big city transplant to the small town where his mother (an underused Amy Ryan, Bridge of Spies) is the new vice principal. Living next door to Stine he becomes enamored with his daughter (Odeya Rush, The Gift) who has secrets of her own. The comic relief of the film comes from Jillian Bell (22 Jump Street) as Ryan’s flighty aunt and Ryan Lee (This is 40) as Minnette’s buck-toothed buddy. Coming off as a young Don Knotts, Lee steals every scene he’s in, providing some genuine belly laughs along the way. Though rated PG, this is one that parents should consider watching first before letting their younger tykes screen it. I found the film to be fairly frightening and a little intense when the monsters get loose. It’s one thing to read about these creepy crawlies but it’s another thing altogether to see them come to life on a very big screen (in 3D if you’re willing to pay for it). Judging by the squeals and shrieks from the young audience I saw it with, parents will want to tread carefully. Even with some misguided moments near the end, the film is welcome fall fare and nice counter programming to the scary adult offerings October usually brings.